In health class you learned you shouldn't pop pimples, but were you paying attention to why not? And, do you still do it anyway? We talked to Jeanine B. Downie, M.D., YouBeauty Dermatology Expert, and director of her own practice, image Dermatology, in Montclair, N.J. The Answer: Acne comes in many shapes and sizes. There are black heads, white heads, tender red bumps and large red nodules. Whatever form a zit takes, you might be tempted to squeeze it into oblivion. Resist! Popping a pimple doesn't actually make it go away. In fact, it usually exacerbates the problem and can leave you with scars. Or worse, you could end up with a skin infection-and scars. The causes of acne are varied and complex. Family history, hormones and stress can all play a part. Basically, pimples form when sebum, your skin's natural oil, gets trapped under the surface. It can mix with dead skin cells and form a plug called a comedone, or it might react with P. acnes, a bacterium found in hair follicles, triggering inflammation. 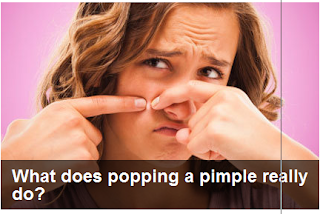 When you pop a pimple, you force that gunk out so hard that it's actually ripping your skin. As you press, you're introducing dirt and bacteria from your fingers onto your face and into the pimple, which might become red and infected. (Dr. Downie has seen nightmares.) This can also create permanent pocks and marks. Dermatologists can perform what's called an extraction, which is when they use an instrument to unblock clogged pores. They press lightly to release a comedone-and know when to stop. For safety, dermatologists use sterile equipment, wear gloves and clean the area with alcohol wipes. There are plenty of ways to treat and prevent pimples, from products containing chemical exfoliants and antibacterial agents such as salicylic acid, benzoyl peroxide and retinol, to prescription medications and dermatologist procedures including glycolic peels and laser or light treatments. With these tools you can take pimple problems into your own hands-just not literally.